This article is about the Hindu deity. For the Muslim mystic, see Jhulelal (Sufism). 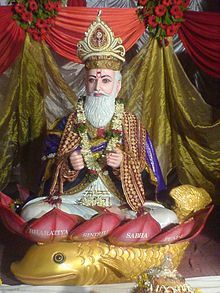 For Sindhi Hindus, Jhulelal is a name that refers to the Ishta Dev (most-revered deity) of Sindhi Hindus, who regard him to be an incarnation of the Hindu deity Varuna. [better source needed] The chant Jhule Lal Jhule Lal is considered the "clarion call" of Sindhi Hindus. Jhulelal is traditionally believed to have performed several miracles, typically centred around the Indus River – which Hindus consider to be his abode. Sindhi Hindus worship Jhulelal at the Shrine at Odero Lal in Pakistan's Sindh province, which is jointly used by Hindus, and Sindhi Muslims who revere the shrine as the tomb of Sheikh Tahir. Jhulelal is the Ishta Dev (preferred God) of Sindhi Hindu people. Jhulelal continues to be the unifying force and the centre of all cultural activities of the Sindhi community. The word Sindhi is derived from the River Sindhu, which is the river Indus in Pakistan. When Sindhi men venture out to sea, their women pray to Jhulelal for their safe return. They offer the Lord a prasad of akha, a sweet made from rice, ghee, sugar and flour. Sindhis all over the world greet each other with the words, "Jaiko kendo Jhulelal thenja thinde Beda-Paar". Although the exact time and year of Jhulelal's incarnation is not known, his birth year is estimated sometime in the middle of the 10th Century. It is widely believed among the Hindus that the Water God incarnated as Jhulelal. The baby Jhulelal was then born on the first day of the Hindu month of Chaitra. Upon hearing of the infants birth, Mirkhshah commanded his minister Ahirio to kill the infant with a poisoned rose petal. When Ahirio saw the infant, Jhulelal smiled and the poisoned rose petal blew out of Ahirio's possession. When Ahirio caught sight of Jhulelal for a second time, he was startled to see that the infant had grown into an elderly man. The elderly man was then said to have turned into a young man, and then a warrior on horseback before Ahirio's eyes. Ahirio returned to recount the story to Mirkhshah, who then lambasted Ahirio, and told him to leave and call out for Jhulelal by the banks of the Indus. Upon calling for Jhulelal, the warrior on horseback appeared out of the river to appear to Ahirio with an accompanying army. Terrified, Ahirio begged Jhulelal to restrain his army. Jhulelal's army then disappeared back into the River Indus, while Ahirio went back to the palace to recount the story to Mirkhshah. Mirkhshah remained skeptical, but invited Jhulelal to his court. Jhulelal is then said to have vanished, leaving Mirkhshah enraged. Jhulelal's followers then rushed to the house in Nasirpur where Jhulelal was born, and found Jhulelal there as an infant. The infant consoled the distraught Hindus and commanded them to assemble at a temple near the Indus River. Upon assembling, a firestorm broke out and engulfed Mirkhshah's palaces. The king escaped to the banks of the river, where he found Jhulelal, now again a warrior, and his Hindu followers protected from the firestorm. The kings fell at Jhulelal's feet, and Jhulelal dismissed the storm with the movement of his hand. The Cheti Chand festival in the Hindu month of Chaitra marks the arrival of spring and harvest, but in Sindhi Hindu community, it also marks the mythical birth of Uderolal in the year 1007. Uderolal morphed into a warrior and old man who preached and reprimanded Mirkhshah that Muslims and Hindus deserve the same religious freedoms. He, as Jhulelal, became the saviour of the Sindhi Hindus, who according to this legend, celebrate the new year as Uderolal's birthday. Chalio or Chaliho, also called Chaliho Sahib, is a forty-day-long festival celebrated by Sindhi Hindus to express their gratitude to Jhulelal for saving them from their impending conversion to Islam. The 40-day-long festival is observed every year in months of July to August, dates vary according to Hindu calendar. It is a thanksgiving celebration in honor of Varuna Deva for listening to their prayers. The Jhulelal Shrine at Odero Lal is situated in Matiari District, almost 40 kilometers away from the Sanghar District of Sindh; The Hindus and the Muslims can pray here at the same place simultaneously. Nawabshah, Hyderabad, Matiari, Sanghar and Mirpur Khas are the nearby major cities to reach at the Shrine near Tando Adam. In the most common form, Jhulelal is represented as a bearded man sitting cross-legged on a lotus flower that rests on a palla fish. The fish is seen floating on the Sindhu river. He holds a sacred text and sometimes even a rosary. He wears a golden crown with a peacock feather and wears regal clothes. Generally, temple idols represent him in this form. In another form, he is shown standing on a palla fish or the lotus flower, holding a staff with both hands to indicate leadership. ^ a b Lari, Suhail Zaheer (1994). A history of Sindh. Oxford. ISBN 0195775015. Retrieved 19 December 2017. ^ a b Bhavnani, Nandita (2014). The Making of Exile: Sindhi Hindus and the Partition of India. Westland. ISBN 9789384030339. ^ Zahida Rehman Jatt (June 3, 2015). "Jhulay Lal's cradle of tolerance". Dawn. Dawn. Retrieved 22 December 2015. ^ Claude Markovits. The Global World of Indian Merchants, 1750–1947: Traders of Sind from Bukhara to Panama. Cambridge University Press, 2000. p. 48. ISBN 9781139431279. Retrieved 22 December 2015. ^ "List of Cities near Udero Lāl in Sindh, Pakistan". GoMapper. Retrieved 22 December 2015. ^ Parveen Talpur. "Fish Symbol: Indus Civilization to Biblical References". parveentalpur.com. Retrieved 22 December 2015. ^ Nadeem F. Paracha (December 20, 2015). "Jhulay Lal's full circle". Dawn. Dawn. Retrieved 22 December 2015. ^ Mark-Anthony Falzon (2004). Cosmopolitan Connections: The Sindhi Diaspora, 1860–2000. 9. Brill Academic Publishers. p. 59. ISBN 90-04-14008-5. Retrieved 1 February 2014. ^ Boivin, Michel (15 Oct 2008). Sindh through History and Representations: French Contributions to Sindhi Studies. Oxford University Press. p. 76. ISBN 9780195475036. ^ Falzon, Mark-Anthony (2004). Cosmopolitan Connections:The Sindhi Diaspora, 1860–2000 (International Comparative Social Studies, Vol. 9). Brill Academic Publishers. p. 59. 9789004140080.